This is our outgoing A-level specification, available for re-sits only. 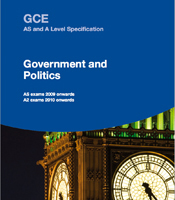 A-level Government and Politics enables students to develop their critical thinking skills and enhance their ability to interpret, evaluate and comment on the nature of politics. The specification is broken down into four units. Units 1 and 2 are covered at AS and units 3 and 4 are covered at A2. At AS students will concentrate on people, politics and participation as well as governing modern Britain. At A2 students will learn about the popular options: US politics and US government and ideologies. Other options have also been introduced, including political issues and ideologies in action. This course is particularly suitable for students who have studied Economics, History, Sociology and English. It may also appeal to students who wish to study Government and Politics or History at a higher level. The last January exams for AS and A2 were in January 2013. The exams are now only in June due to Changes to A-levels.